Kojo is a hardworking boy from Ghana,who is very poor. When Kojo was a little boy his. Father past away now Kojo is trying to save some money.Kojo and his mum had to sell firewood to the market for his family.Each day Kojo collects some firewood to sell at the supermarket.when his mother receives a loan from some village families,she gives a little money to her son.When Kojo has the money he need's to think wisely. 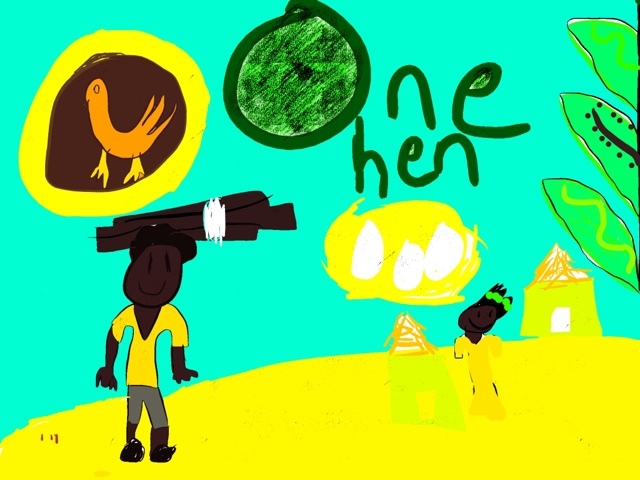 Kojo knew what he was going to one hen.Kojo was going to eat two eggs and sell three at the supermarket. Kojo sells his eggs at the market and buys more hens.Kojo goes to school for six months.Kojo was going to buy a chicken farm.Kojo started a trust that gives out small loans to people who cannot get a loan from the bank.when they earn money Kojo the some employees for this trust.When the employee's hand out some loans to people that have no money.The people will get healthier and stronger and a good life too.